Dominic Tancredi has found a way to make a living doing what he loves. 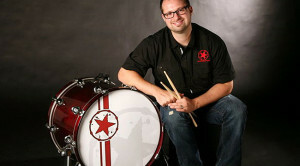 He has taken his passion for drumming and turned it into a career. Woodshed Stage Art has grown from a custom drum head business to a full stage art company making products for some of the biggest names in music today. Can you briefly explain what Woodshed Stage Art does? We help bands keep their name in front of the audience with custom stage artwork like drumheads and backdrops printed with their logo. Being able to work in a field that you’re passionate about is everyone’s dream. How did you first get the idea for your business? It is! I’m lucky to be making a living in the music industry. I’ve been playing drums since before I could read, and I’ve always been into art. I decided to study business in college instead of music, and always knew I wanted to figure out a way to work in music. When I started Woodshed I was playing in a band. People would always come up to us after our show to ask what the band was called. I got sick of answering the question, so I put the band name on my bass drum head! I started doing this for friends’ bands, and friends of friends, and it all kind of snowballed. It certainly has snowballed. More than 100 million people recently saw your work. Would you like to talk about that? We’ve been working with Bruno Mars since they were playing small clubs. We print all of their custom kick drum heads for their tours, TV appearances etc. They let us know they’d be performing on the Super Bowl halftime show, and Bruno made a point to make sure they had custom kick drum heads for the event. We work with really tight deadlines all the time, as well as a lot of cooks in the kitchen when it comes to choosing final art. It’s all part of the business. But, the Super Bowl was a real challenge for us. Though we knew several months in advance that they’d be performing at Halftime, the final designs weren’t chosen until the night before! In the weeks leading up to the game, we created about two dozen designs–including one for the drumhead Bruno used on his own drum solo, a tribute to his late mother, Bernadette. Since they couldn’t decide which they liked best, we ended up overnighting about ten custom-printed drumheads and Bruno chose his favorite two in person. Even I didn’t know which ones we’d see until it was live on TV. If anything had gone wrong, we wouldn’t have pulled it off. It must be exciting watching a band go from playing small clubs to performing at the Super Bowl. Who are some other clients that you’ve done work for? It is! We’re lucky to have formed long-term relationships with a lot of musicians. Country artist Jason Aldean is another one we’ve been working with for a long time. I met his drummer, Rich Redmond almost ten years ago, when Jason had his first hit single on country radio and they were playing honky-tonks around the country. The next year they got a big break to open for Rascal Flatts, another one our clients, and now they’re headlining sold-out stadiums around the country. That’s part of what I love about working with new bands. I’ve seen so many success stories over the years. You never know what garage band will be selling out arenas in a few years! Some of our other clients are Jay-Z, Carrie Underwood, Taylor Swift, Kelly Clarkson, Boston, Kansas, Elton John and The Avett Brothers. That’s quite an impressive roster, can you explain a little about the process that you go through with a client? When a client contacts us, we discuss the size venues they’re playing and their goal for the stage art–to get their name visible to the back of the club, print the album artwork on stage, or if they just need art that goes with a bigger-picture stage/set design. We narrow down the numerous options we have available, typically based on their budget. In the case of our custom drumheads and guitar and bass cabinet grill cloth, we also discuss some choices based on sound. Once we narrow it all down, the order goes to production and is on their stage in about two weeks, although sometimes it is quickly as the next day. Your clients cover a wide range of genres. Does the music affect how you approach the design? Sometimes, yes. We like to play around with some unique finishes that will really catch the light on stage and make the artwork memorable, but it’s not for everyone. For instance, we’ve done some cool glow-in-the-dark artwork for Jay-Z, and some cool iridescent sparkle projects for Carrie Underwood and Kelly Clarkson, but those types of projects would never fly in the more traditional country or rock worlds! For the super-traditional country acts we can make the artwork look 100 years old. Most bands tend to stick to their genre’s comfort zone when it comes to artwork, but the bands that push the envelope a bit do tend to stand out more. How would you explain the importance of branding to a new band? From a business standpoint, branding is critical. How you look is as important as how you sound. There are tens of thousands of great bands who will never make it out of the local club scene, in part because of lack of branding. The worst thing a band or artist can do is play a great show in anonymity. Even those who loved them will have a hard time finding them again to recreate the experience, bring their friends and buy their music. How many times have you been to a show and saw a fantastic opening band, but had no idea who they were? That’s a huge opportunity lost. Think of the fans in the audience taking pics and video to post on social media…then think of all the people who will see the post. If your band’s name is visible, it’s a win. If not, it’s a huge loss. Speaking of the local scene, you also play drums and teach in Cleveland. What projects are you currently working on? Playing and teaching is a great outlet for me. I teach private drum lessons once a week at the Aurora School of Music. I also work with a cool trash-can percussion group at St. Edward High School (my alma mater) called The Trash Talkers. I’m playing drums with a few local artists including Maura Rogers & The Bellows (singer/songwriter folk) and Kristine Jackson (blues), and I occasionally fill in with other bands. I’ve done a dozen or so studio albums as well. It sounds like you’re really keeping really busy. Thanks for taking time out of that packed schedule to do this interview.